As an analysis, we reviewed our records and charted the number of openings that we were listed during the past two years on the Jobs page. As previously mentioned, the job listings are created from publicly posted jobs that we find on various web site or information provided to us by the hiring companies. 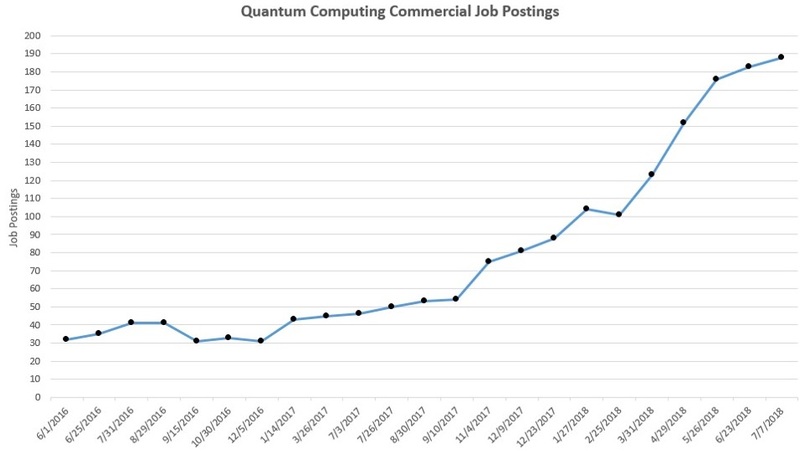 The results are quite interesting and show a six-fold growth in posted quantum computing job openings over the past two years. We do expect this trend to continue as more companies make investments to better understand how they can benefit from quantum computing. In fact, in order to make the listings more manageable, we have just divided the single worldwide list into two separate lists, one for the U.S. and Canada and another for Europe, Asia, and Australia. You can see the results of this analysis in the graph below.